I had a stroke some ten years ago and I was encouraged to go to a craft meeting with a friend, and recovery from the stoke was just fantastic through this hobby, which is now much more than just a hobby. I hope some of my cards are liked a little. I came across your website while looking for the grand calibur on YouTube. ALL these cards are just amazing and I really do love them every one. I am so glad that you found something you really enjoy to help you over such an illness and I hope you are well on the way to recovery now. 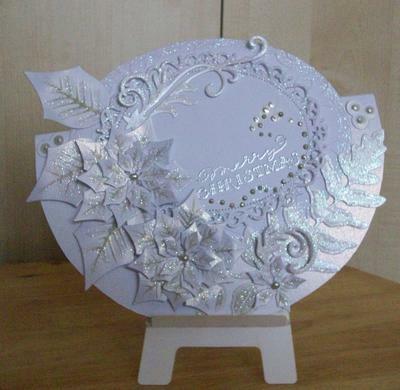 The "Bookatrix" card is beautiful and is one of the Glitter Girls many dry embossing boards. There is a link to their website in the Resources page and an explantion of what Dry Embossing is in the Techniques section in the NavBar to your left. Your cards will be an inspiration to many, and the lovely people that visit the website will tell you what they think ... and you just watch the comments come in about them. 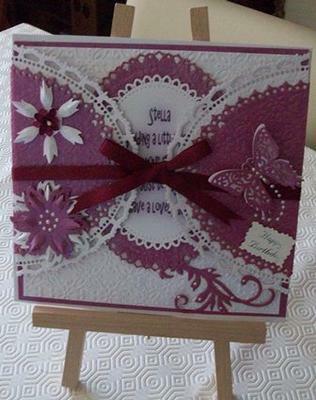 This is an 8 x 8 card and I used three A4 silk Pink and 1 A4 white for this card. I already keep a stock of shoes. My friend asked me if I could do something a bit different for her niece. This is so beautiful Margaret and so delicate in the lovely pink and white. I see the Spellbinders Parisian Accents have been used here and don't they make the card look really special. And I love the addition of the faux pearls too. 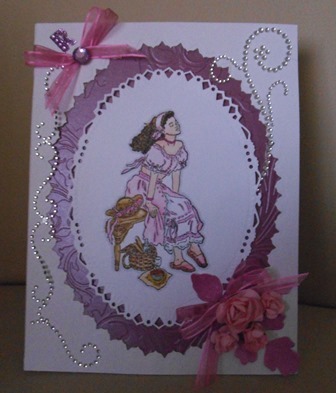 How delighted is the recipient going to be when she gets this fabulous "Keepsake"
I do not have a story for this card, only that this was ordered by a friend for a relative, and this is inspired by you Christina. I hope you like what I did with it. I really do like the card Margaret and the colour of it is so rich. 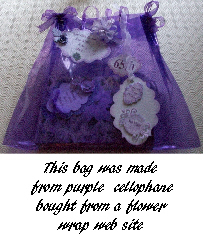 It looks very intricate and the cellophane bag is very inventive. I am sure that the recipient will be as pleased with it as you were to create it. The Spellbinders combined with imagination is a winning design every time. 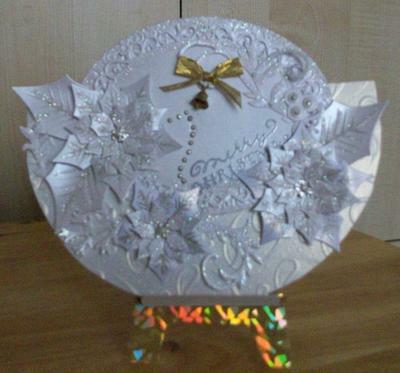 If you are new to Spellbinders then please visit the Video Tutorials for a whole series on using them and for many ideas on making them work for you. 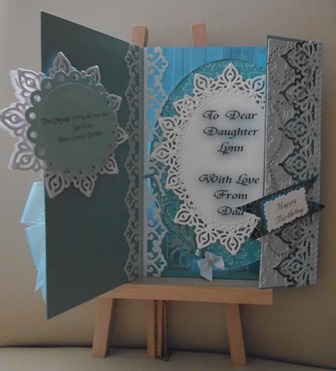 These cards were created from four sheets of Baby Blue silk card, two of white one of them I embossed and glittered the edge. 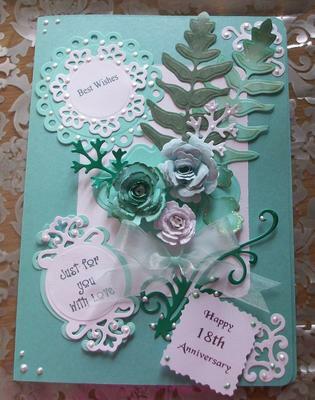 The Minty card also used Parisian Ascents, Aster flowers, Labels I think was 21, glitter stickers, and decorative paper. Not made the boxes yet, one is 8*8 the other one a little smaller. 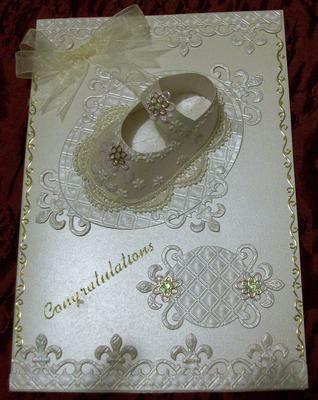 The cream Baby shoe was made from two sheets of cream card one of ivory, and Fleur De Lis die cuts, and gold stickers. 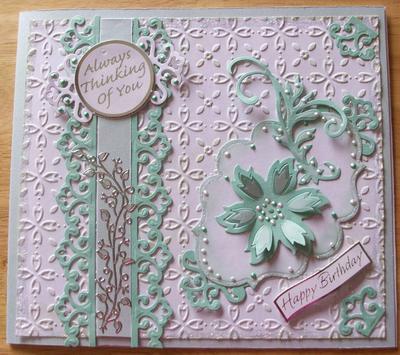 What a wonderful collection of cards all created with Spellbinders. The colours are fresh and the layourt of each card is lovely. I absolutely love the baby shoes that you add to your cards Margaret they are just adorable for any baby projects that can be made. They would be perfect to make a pair and add to a little gift box for the new mum to treasure... especially if the new babys' name was added too. These two cards are for a friend who asked me if I would do a card for a 40th birthday. It only has to have the 40th added to it then I think it is finished. I used the tr-fold card for this 40th Birthday card, two A4 white, I mixed dark blue, green, and white ink until I had the color I wanted. I used a Mather Stewart punch on the top edge, after cutting an angle off and then rubbed the color over the edge softly. 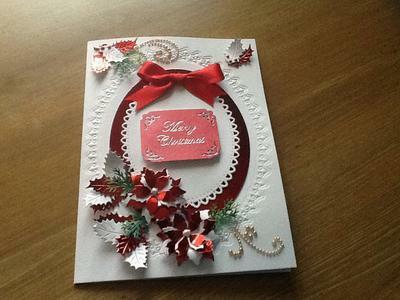 The second card is 8x8 Christmas card in a frosty style. Some winter paper was used for the large flower. 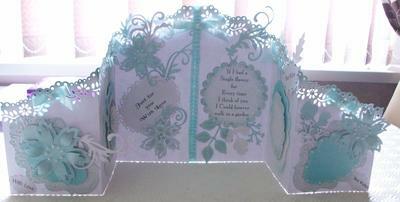 I used one piece ice blue card, two pieces of plain white card all A4. 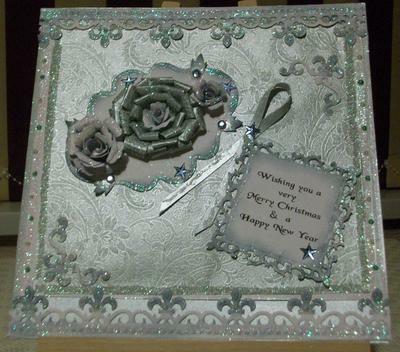 Fleur De Lis dies, bitty blossoms flowers, a small strip of card folded to look like ribbon, some glitter, liquid pearls and jewels. Oh! What beautiful cards, both of them... I can't choose a favorite as they are both lovely. 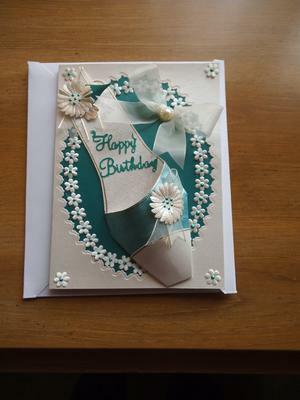 The Tri-fold card looks very intricate and perfect for that special birthday. I am sure the recipient will be delighted with it. For these I have used up some odd pieces of red and gold, the white and ivory were whole pieces of A4 crystal white & A4 ivory, and some odds of gold. For the little box I did the same thing as the video tutorial, but I decided to put an opening top to house a gift. I cut some hook and loop dots in half and stuck them to tree sides , and glued the forth, but I think I will try it on all four sides, to make a completely removable. How lovely are these projects and you have done a really good job with them all. I like the opening box lid and it is just big enough to add a small gift... and I am sure it will be well received by the recipient. 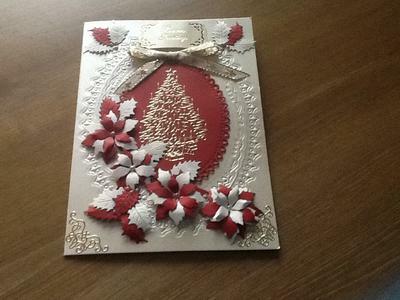 The cards are really beautiful and those Poinsettia dies make fabulous flowers. But they are not just winter flowers either ... this is a die that can be used all year round. Later I will show you how to turn them into beautiful summer blooms to grace even more of your cards... giving you more for your money!! 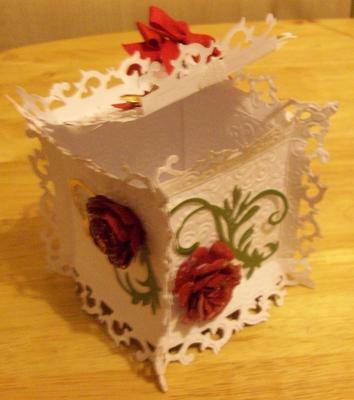 I thought I would try the boxes, had a go at 12*12 card and a small one 8*8 card. Using the same way to measure the lid for the small one, I also cut some Bitty Blossoms, it turned out quite pretty I think. What a lovely selection for Christmas. 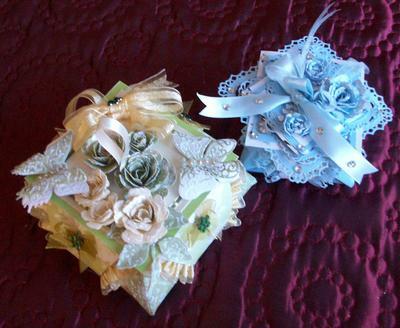 The boxes are really pretty and such a good way to add a small gift. 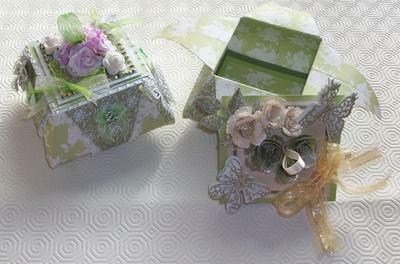 I hope you found the video easy to follow and if you would like to make these pretty boxes as Margaret has done, for yourself then take a look at Origami Boxes in the Video Tutorials section. 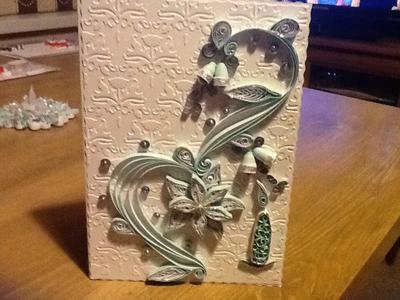 This card was made as 8*8 I liked the card you made with the Grand Decorative Ovals so much Christina I thought I would give it a go. You're right they are such pretty dies. 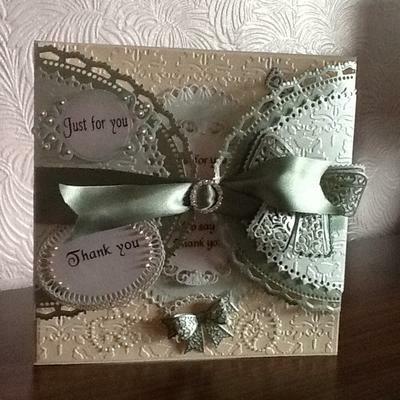 Well all In can say is" Wow" .... this is such a beautiful card and I am so glad that you enjoyed the tutorial. When I get submissions like this it makes everything I do worthwhile and I am so happy that you share your designs with us all. I try to keep the video tutorials easy to follow and it is very rewarding for me to see what you have come up with. I also decided to make the sandals this time instead of shoes this was made for my daughter-in law's sister who has recently had a baby girl named Scarlet, this is one of my favorite things to make. I absolutely adore the baby shoes and sandals that you create Margaret they are just beautiful. And how much more special by adding them to a box. This is sure to be a gift that will be treasured for many years to come and probably added to a "Memory box" for the baby to see as she grows older. I thought you may like to see this one, not sure if I have it quite right but there is no story behind this card. Apart from it being my first attempt at using Spectrum Noir Pens for a birthday card to a friend. I found it quite relaxing to do, as I have been busy of late making my patterns. Very pretty and your first attempt with the Spectrum Noirs has turned out really well. I too find it very relaxing to sit and colour ... takes me back to childhood days... and the pens are very easy to work with. 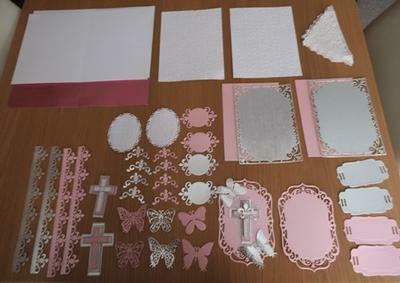 Your friend is sure to be pleased with the work you have put in to make her card extra special. A friend asked me to make this card for the 18th of this month. 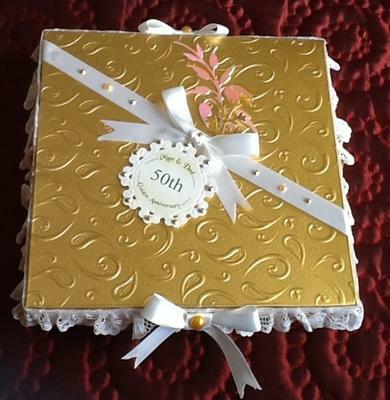 I used two 12*12 gold card for the box, plus white lace and satin ribbon, Spellbinders Grand Decorative Ovals, and a card creator on the inside, plus 4 x 4 white card two of which were embossed. 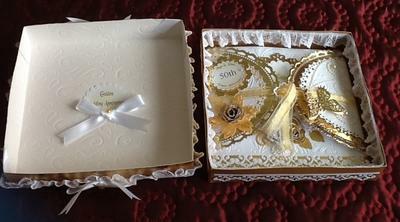 I also used gold foil card and Spellbinders Bitty Blossoms, gold and white pearls. This was also a 8*8 card. Hope you like the result of this one Christina, I like this design a lot. Best wishes Margaret. Oh "Wow" ...you hope that I like this card Margaret .... 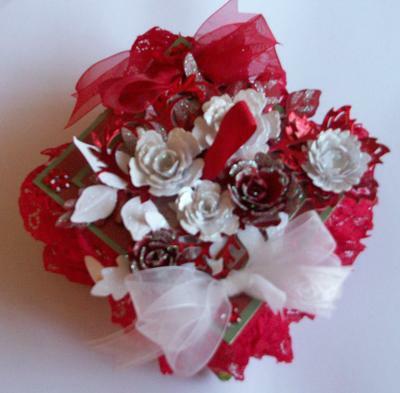 I LOVE it ... it is simply gorgeous and a real keepsake for the recipient. Another request, so I have put the layout on this time, and I am half way through, do not have to rush this one as it is not needed till July. A very kind sentiment indeed Margaret but it is YOU who make the cards. I only supply some of the ideas that you may like to try and then you go away and put your own spin on things. And ALL of you never cease to amaze me with what you come up with and they are all gorgeous. 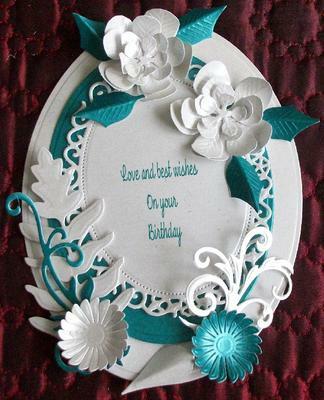 This card is just a simple birthday card, one sheet of A4 blue, 2 sheets of A4 blue foil,2 sheet of A4 white. I think the other two are lilac, purple and white, again A4 white card *2 sheets mauve * 2 sheets, and one purple foil, and again all Spellbinders dies. How could any one NOT like them Margaret they are gorgeous all of them. And the more you use Spellbinders the more you fall in love with them. My special favorite would have to be the blue one as I just love the colour and the layout of it... and that bow is to die for. This card was made for my husbands brother and wife for their 18th Anniversary. I saw this style on Carols web page and it looked so good when she did it, mine is not so good I don't think. 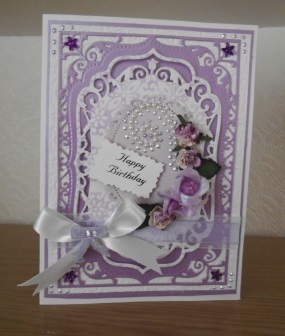 I used 2 pale lilac, 2 darker lilac, one White card all A4 size, liquid pearls, Spellbinders dies mix. The first word to spring to mind with this card was "Wow" it is gorgeous and you must be so pleased with yourself and the card. The picture of the happy couple is such a personal touch and they will feel so special when they get the card. 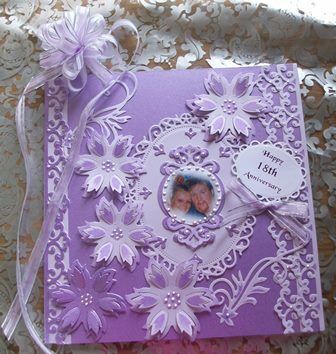 I love the colour and the Spellbinders are just amazing. 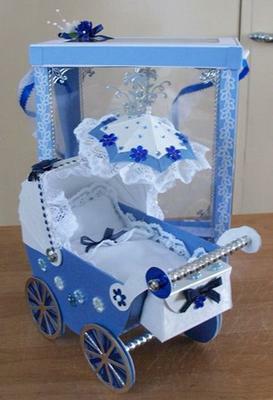 And what can I say about the Pram.... how adorable and what a lovely "keepsake" for a New Baby. 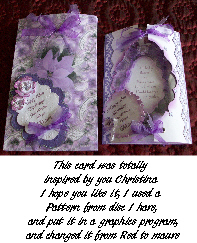 Hi Cristina, this is my first card in the hinge style. 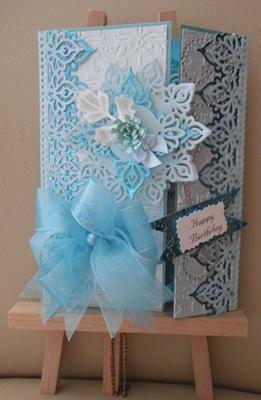 I used 2 A4 white, one turquoise,and one lemon, and my spellbinders dies. I have only done a couple of cards since breaking my wrist, so I thought I would try this one for my my friend, have a good Christmas best wishes Margaret. 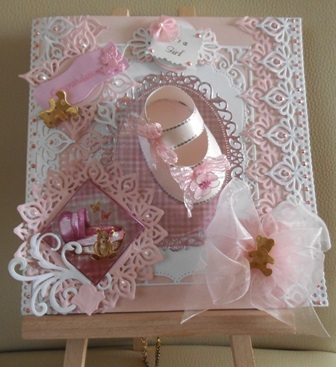 My latest baby card was 8x8 pink 2xA4, white 1xA4, and some gold and pink teddies. White and pink liquid pearls. 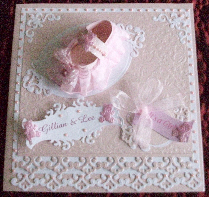 Both of these cards are really pretty ... but how I love those baby shoe cards that you make ... they are adorable. 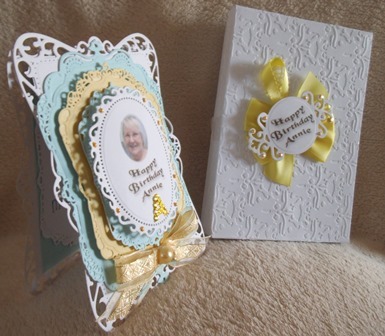 Your friend is going to love that card as it is so personal and the turquoise and lemon look well together. 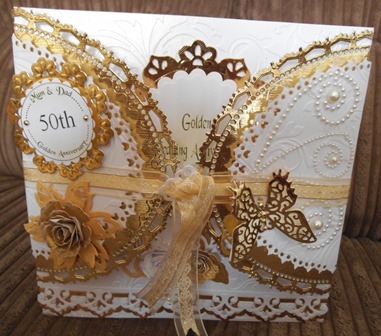 This is another Golden Wedding card. 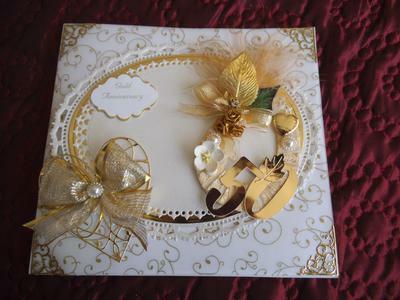 I used 4 sheets of A4 cream card, 1 gold embossed vellum, 2 sheets of gold mirror card, Spellbinders grand decorative ovals. I created a horseshoe and decorated it, and added a memory box die heart. This was a request by a friend and I still have one more to do. Hope all are well Margaret. 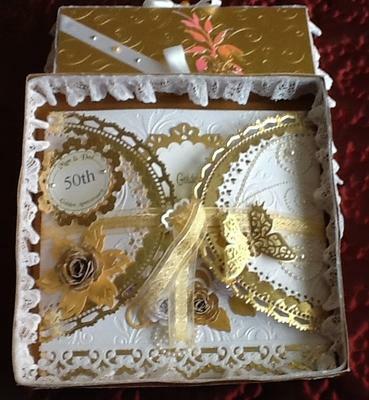 A very beautiful card for the special anniversary of the Golden Wedding. I am sure that the recipients loved it and will add it as a "Keepsake" to their treasure chest. 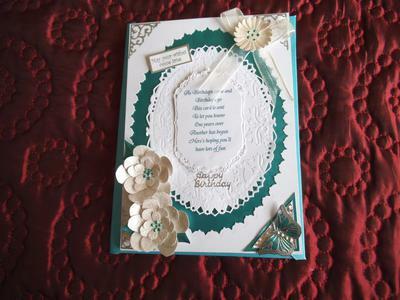 The teal card was 1 A4 teal,1 A4 white, kingfisher liquid pearls, spellbinders grand ovals, poinsettia dies with points trimmed off. 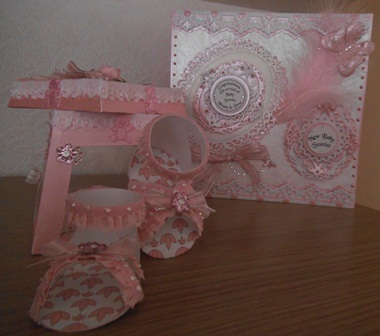 The shoe card is kingfisher and cream, 1 A4 cream, 1 kingfisher A4, liquid pearls, cream flat silk flowers. 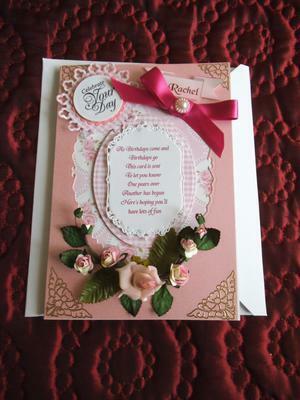 All these cards are so very pretty and I just love the addition of flowers on any project. 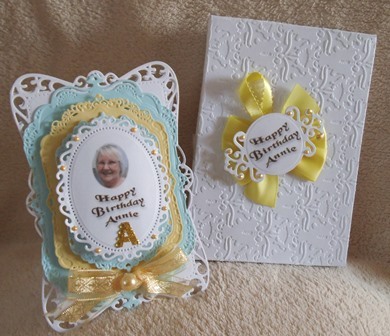 I am sure that the recipients are going to love them when their special day arrives and that the card will be treasured for a long time to come. 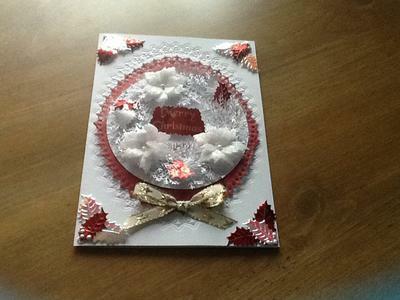 This set of cards are for friends, the first one is made from plain white A4 base card, embossed with spellbinders decorative ovals, and grand ovals plain edge, I used tattered Lace poinsettia flowers and leaves, red foil card,white liquid pearls, and a little green. The second card was made with the same dies, plus some A4 red and gold adhesive backed glitter paper, I pealed this off the backing, and placed it on to a A5 piece of white card, and used the same dies as the above card. 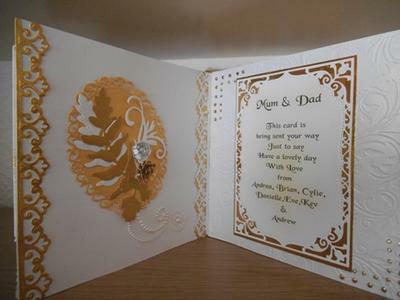 Third card was made the same style as the fist card, but cream gold, and red A4 card,plus a gold tree sticker. 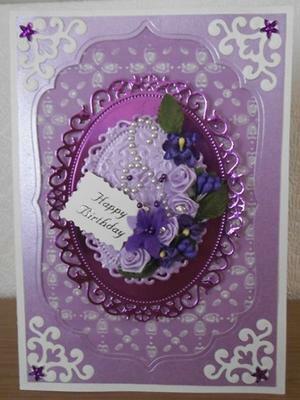 The fourth card was made the same style as the first, white, red, A4 card, but vellum was used for the flowers. What a beautiful selection of Christmas cards and I would not be able to choose a favorite as they are all gorgeous. Well done ... now can I go on your Christmas list please ???? 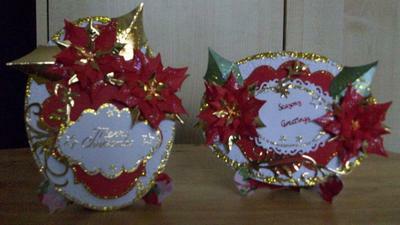 Christmas Cards and table decorations.For the first card I used 3 A4 sheets of plain white card. I cut and embossed one piece for the font and inside, one piece used as base card, third piece used to print inside sentiment, then I decided to have a go at quilling. 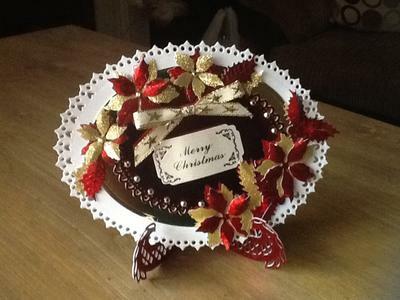 So the decorations on the front are my quilling effort. 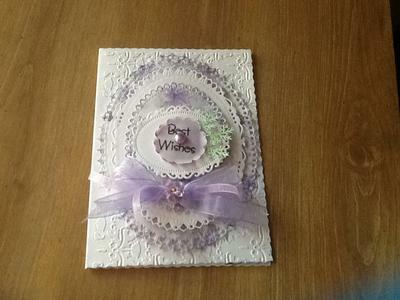 The lilac card was a get well card, for a friend of a friend, 3*A4 white card stock, one used to print pattern, spellbinders grand decorative ovals dies used on this one. 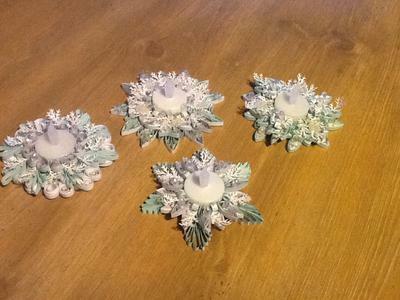 Table decorations were quilled, I bought four tea lights for £1.00 put a strip of paper round the tea light glued the end. I then rolled my quilling pieces and glued them to the paper strip round the lights the end result is quite effective I think, and enjoyable to do. 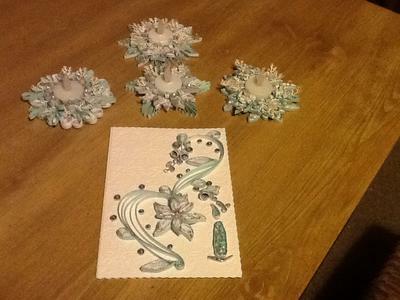 I used pale blue, pastel blue, and white, found some jewels in a box I have full of beads, hot glued these onto places round the quilling very effective for this years cool look in my house. Thank you for the instructions on how you achieved the look so that others can follow what you have done to get this very pretty table set for themselves. 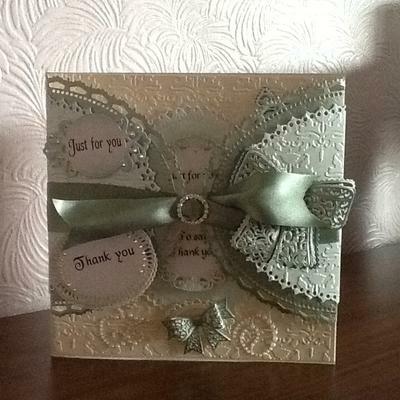 I can not go into detail, just to say it was a request for a special thank you card. 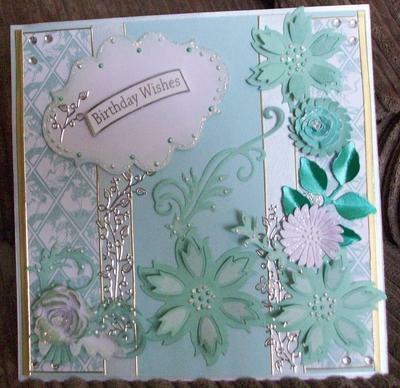 I used grand decorative ovals, other ovals for this card and 3 times A4 cream silk card, 2 times light green silk, 1 dark green star dream card. I have to admit that this design is one of my favorites and it looks so fancy once it is completed.